A four-day visit to Disneyworld to watch the grandkids experience their first trip to the Magic Kingdom resulted in a Mothers Day dinner for my wife and I at Charley’s Steak House on International Drive in Orlando/Kissimmee. Much to our surprise they were having a Mother’s Day special where “Mom” gets a free filet dinner with any entree purchase of equal or greater value. We thought that was a great promotion. We did not have reservations so a 15 minute wait for our table seemed quite reasonable. 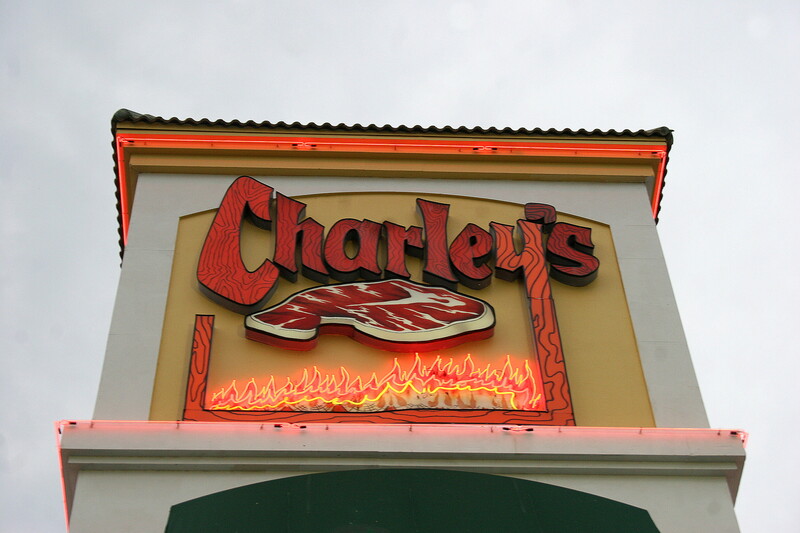 There are four Charley’s Steak Houses in the area and they are part of a restaurant group called “Talk of the Town”. Our server conducted a 10 minute table-side dissertation on the meats selected by Charley’s. We were told the beef was all Grade A Choice and that they were all cooked over an open flame at 1200 degrees. 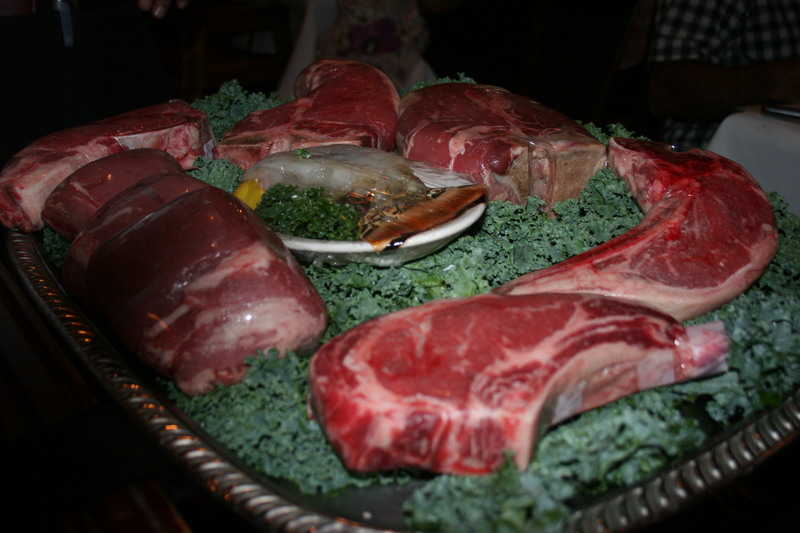 He described each cut, the sirloin, the bone-in rib eye, the porterhouse and the filet mignon. 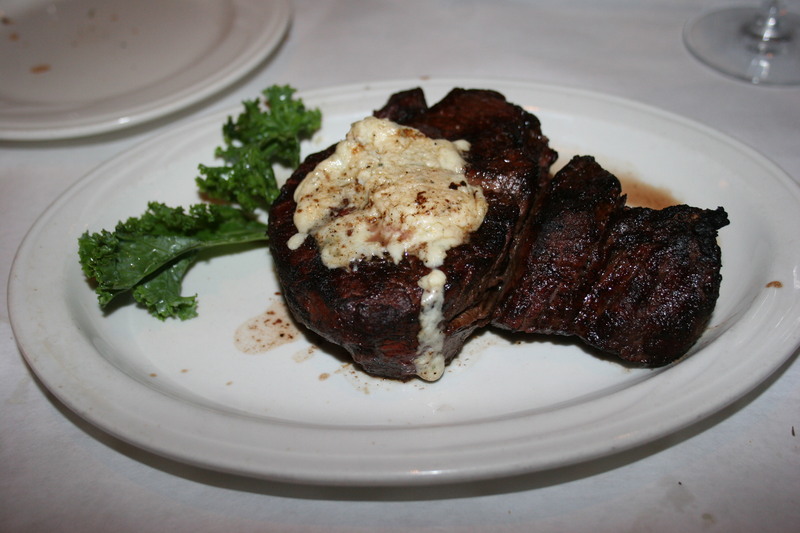 Since my wife was having the Mother’s day special “free filet”, a ten ounce portion, I opted for the 14 ounce filet. We started our meal by splitting an appetizer. We selected the crab cakes. 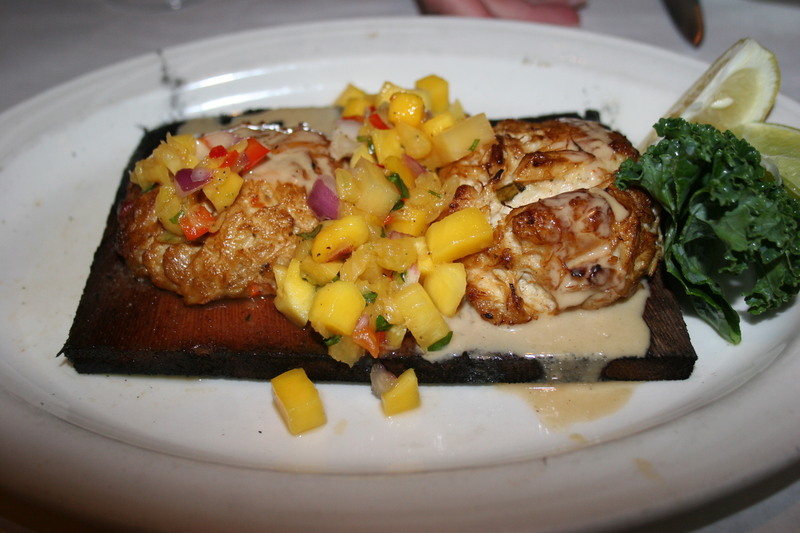 These were two nicely cooked cakes, virtually no filler, rich in crab flavor with a mango salsa topping. A little spritz of lemon on top and they proved to be an excellent prelude to our meal. The House salad was delicious. 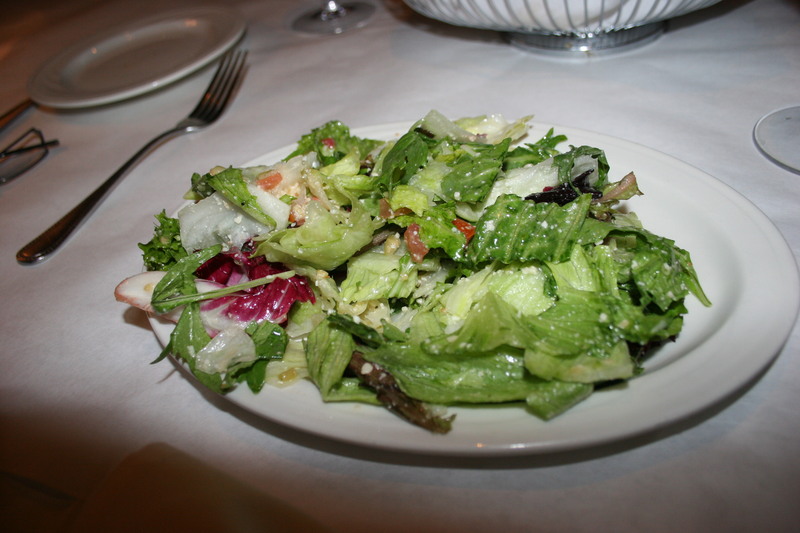 The lettuce was fresh and crisp and the dressing which was a seasoned vinaigrette added the perfect touch. I don’t often rave about salads, except perhaps my favorite, the Wedge, but this one really was exceptional and we both thoroughly enjoyed it. We had each ordered a glass of zinfandel with our meal. My filet was very good. It was cooked medium-well and stuffed with Maytag blue cheese dressing. Lots of flavor and a good-sized portion of quality steak. 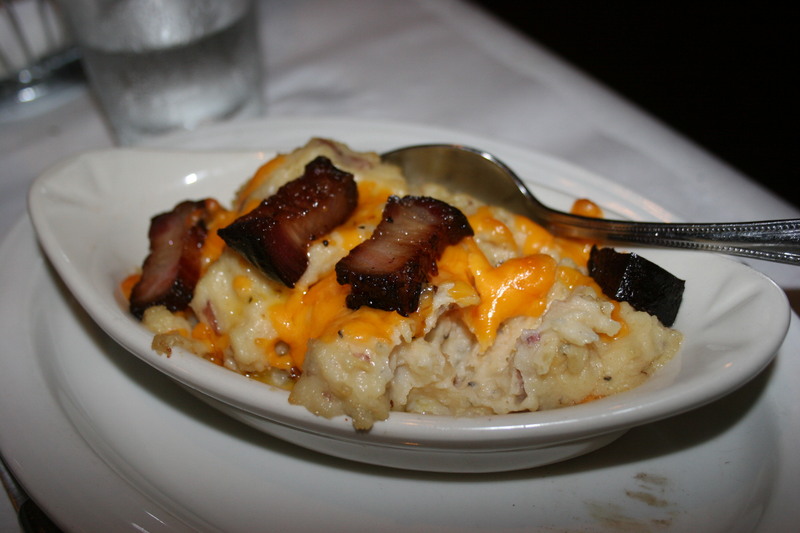 I had the Smashed Potatoes with gorgonzola cheese and apple bacon to accompany the filet. They were okay. I’m not sure what would have made them better. My wife had the Au Gratin potatoes with her filet and I think I liked her potatoes better. Unfortunately, her steak was almost inedible. It was certainly not a smaller version of my filet. It was a tasteless piece of meat that should never have been served. She thought it might have been because it was “free” but I told her it must just have been an accident because they wouldn’t offer a special and then purposely disappoint diners with a poor cut of meat. We joked that she should have them take it off the bill but since it wasn’t ON the bill in the first place, that would have been impossible. We passed on the desserts but had an opportunity to see the choices and there were HUGE slices of chocolate cake and carrot cake and some creme brulee and cheesecake. Overall, my meal was very good and it’s ashame hers was ruined by an inferior piece of steak. Charley’s appears to be a place with frequent return guests as we observed the servers giving hugs to quite a few patrons. They do a professional job and only once did I notice my water glass was not refilled promptly. I think we can call my wife’s filet an aberration and thus I would give Charley’s a thumb’s up for fine dining in the Orlando area.